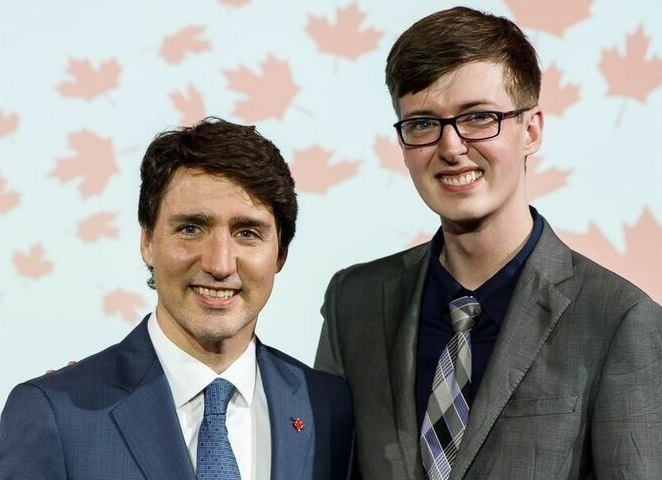 Jordan Kennie, right, with Prime Minister Justin Trudeau in Paris. Fredericton-based CleanTech company Stash Energy has raised about $500,000 in equity investment from the New Brunswick Innovation Foundation and Island Capital Partners. The funding will help the company prepare for a full launch of its Stash M1 Comfort System in 2019. It is now carrying out three pilot projects with the system in P.E.I., and is eyeing international markets through recent work in Colorado and Europe. Last year, Stash Energy raised $200,000 from NBIF, which is now making its second investment worth $250,000 in the company. Island Capital, the Charlottetown-based investment fund, is investing $255,000 in its first investment in Stash. Stash Energy has developed a system that works with conventional residential heat pumps to store energy for later use. Companies around the world are working on energy storage systems so that consumers can store electricity from the grid during inexpensive, off-peak hours and use stored energy when demand is highest. The Stash M1 comfort system is the company’s second-generation product, and Stash believes it will be the most cost-effective and energy-efficient heating and cooling solution on the market when it is launched next year. Stash Energy got its start in the Technology, Management and Entrepreneurship program at University of New Brunswick, where Kennie, COO Daniel Larson, and CTO Erik Hatfield were students. The trio has been working with the City of Summerside since inception to beta test the M1 system. More recently, the company has attended the federal government’s Canadian Technology Accelerator in Colorado. In the spring, Kennie also traveled to Paris, joining a trade mission organized by the Canadian Trade Commission Service for artificial intelligence and CleanTech companies. The trip was successful enough in building relationships that Kennie is planning to return in the summer of 2018. He also got a chance to meet Prime Minister Justin Trudeau at a reception at the Canadian Embassy, which he enjoyed. Disclosure: NBIF is a client of Entrevestor.